I’ve had this cupcake recipe for a few years now and it has been a huge hit with everyone that’s ever tasted them. Using a great combination of two quintessentially Irish ingredients they make for a fun St. Patrick’s Day treat. For those that don’t like Guinness, don’t worry! The stout helps make for a super moist and chocolatey cupcake, so the taste of the beer isn’t too strong. The Bailey’s frosting doesn’t cook out the alcohol, so if you’re making for kids, you may want to substitute with a basic cream cheese frosting – they’re just as good! 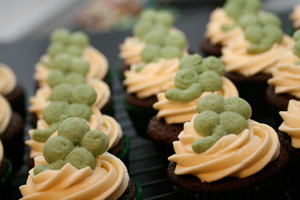 The toppers on these cupcakes are hand-piped shamrocks, using a spritz cookie dough. 1. Preheat oven to 350° F (approx 175°C). Place cupcake liners into the pan. 2. Stir the butter and Guinness in a small saucepan over medium heat until the butter melts, then whisk in the cocoa powder until smooth. Remove the mixture from the heat and set aside to cool. 3. In a medium bowl, sift together the flour, sugar, baking soda, and salt. In a separate large bowl, mix together the eggs and sour cream. Once combined, add the cooled beer mixture into the egg mixture, stirring constantly so as to avoid scrambling the eggs. Gradually add in the dry ingredients until just combined. The batter should be a fairly runny consistency. 4. Fill each of the cupcake liners with about 1/3 cup of the batter (so they’re about 2/3 full). Bake for 15-20 mins, or until a cake tester comes out clean when pushed through the center. Let rest in the pan for about 5 minutes, then transfer to a wire rack to cool completely. 5. To make the frosting, cream the butter in a large bowl using an electric mixer. Gradually sift in the icing sugar, scraping the bowl with a spatula in between each addition. Add in the Bailey’s Irish Cream, then continue to mix on the high setting until the frosting becomes light and airy. 6. 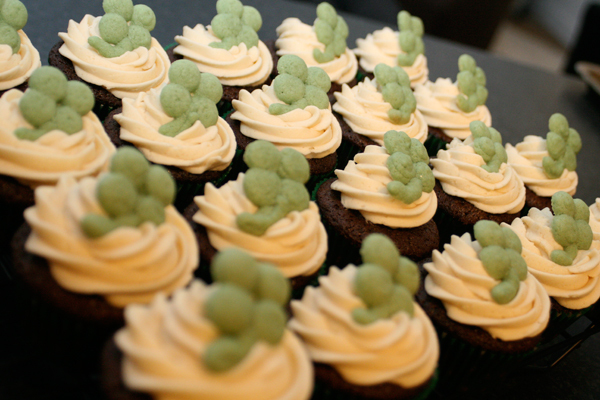 Fill a piping bag with the buttercream and pipe onto the top of the cupcakes.